Shantrese has been a part of the Goodwill family for many years but her path to employment and independence hasn’t always been so easy. Having grown up in Alabama with a learning disability and Attention Deficit Disorder (ADD), Shantrese moved to Milwaukee only to experience family tragedy after her brother was shot and killed as a result of neighborhood violence. Faced with tragedy at such a young age, Shantrese found herself struggling in adulthood with managing her emotions and creating meaningful relationships. Her journey with Goodwill began in Work Services, where she gained on-the-job training and classroom instruction, while being encouraged to strengthen her social and teamwork skills in a supportive environment. With future goals in mind, Shantrese knew she wanted to be productive with a job in the community and set her sights on that next step. With the help of Goodwill’s Supported Employment Program and the Wisconsin Division of Vocational Rehabilitation, she tried several temporary work experiences in the community but none proved to be quite the right fit. Faced with yet another emotional set back, Shantrese was overcome with grief after losing her mother and best friend. With the help and support of Goodwill’s job coaches, she took a step back to focus on her own well-being first before continuing to pursue new job opportunities. After regaining her emotional strength a few months later, Shantrese was ready for work again and Planet Fitness was the right place, at the right time for Shantrese. 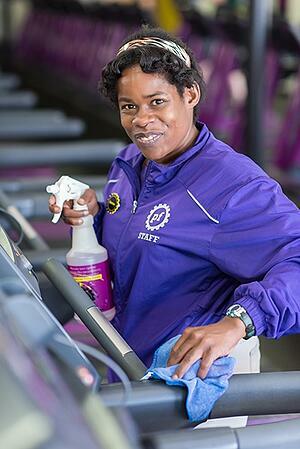 As a staff member, Shantrese helps to keep Planet Fitness looking neat and tidy by following a rotating task list that changes daily; wiping down fitness equipment, vacuuming, washing mirrors and always smiling. Coworkers and gym members alike have embraced Shantrese because her friendly demeanor and strong work ethic. Proving that hard work doesn’t go unnoticed, Planet Fitness awarded her with employee of the month. After the news spread about Shantrese’s positive impact, several Planet Fitness locations throughout Milwaukee County have partnered with Goodwill to hire other Goodwill Supported Employment candidates. Shantrese’s future job goals include working on communication skills with new gym members and possibly conduct new member tours at Planet Fitness.